Does Heathen Address White Feminism On Purpose? 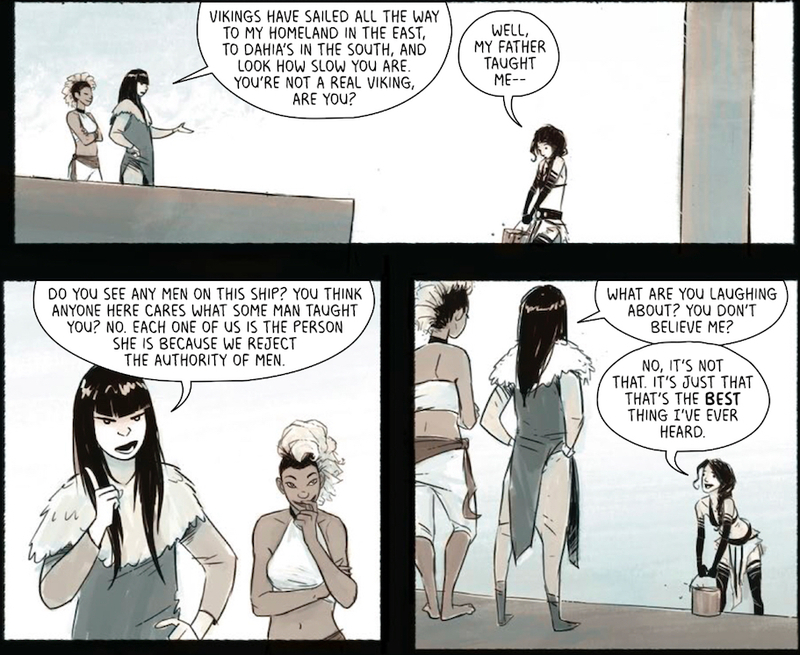 When I first read the collected Heathen graphic novel last year the story spoke to me in ways that I could not fully express, both personally as a queer woman and as a feminist. This lesbian viking mythos that writer, illustrator, and colorist Natasha Alterici has created over the last couple of years expresses so much more than the tale of a warrior; it shares the personal despair and determination that swirls inside the hearts of queer people everywhere. Aydis, the main character, is a young viking woman who is on her own. Yet she has little to no fear when she encounters problems, strangers, and strange phenomena. She is a determined young woman whose aim with her bow is as strong as her snappy commentary and stubborn pushback. All of these are elements of Heathen that Alterici has managed to weave into an engaging story. 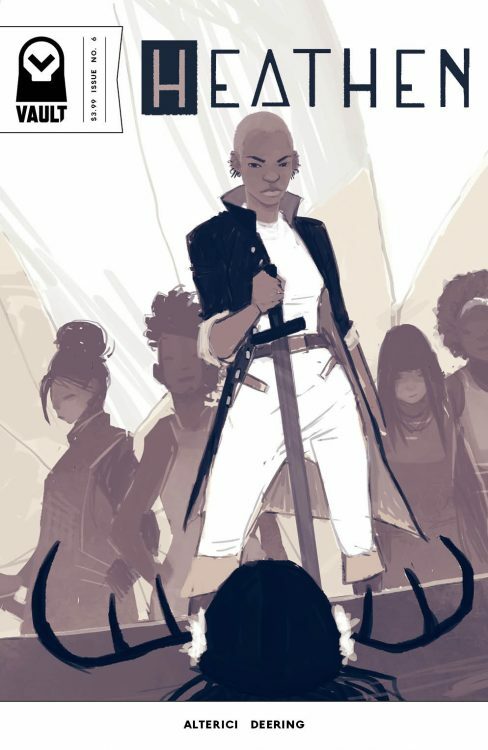 The most recent issue in the comics chronicle of Aydis’s journey is Heathen #6, the chapter in which she boards a ship to continue her adventure. The vessel that Aydis ends up on at the end of issue #5 has an all-female crew of women of color who roam the seas fending for themselves. Aydis is the only white woman on this ship, and she had bargained with the ship’s captain, Makeda, for her passage at the end of Heathen #5. Though the comic seems to imply that Aydis may feel an affinity with these women because she shares their status as a societal outcast, her behavior on board the ship had me questioning the central character of Heathen for the first time since I started reading it. From the outset of the ship’s journey Aydis does not take the time to step back and look at the experiences of those around her. Instead she barrels through her own experience, forging through her own methods without asking very many questions. She seems to be more interested in her own personal needs and perpetuating her own identity rather than listening to the critique of those around her. This becomes obvious as she interacts with the ship’s crew over time in issue #6. Aydis is given tasks like the rest of the women on board, and is not particularly proficient at any of them. Yet when she receives feedback from various women who disapprove of her methods and have a hard time accepting her, her general response is to give push back and make an excuse. This kind of “Well, actually…” is a form of conversational condescension that, within the narrative, invalidates the original statement and dismisses the other party. Here Aydis uses the “Actually…” mode of conversation when these women doubt her. 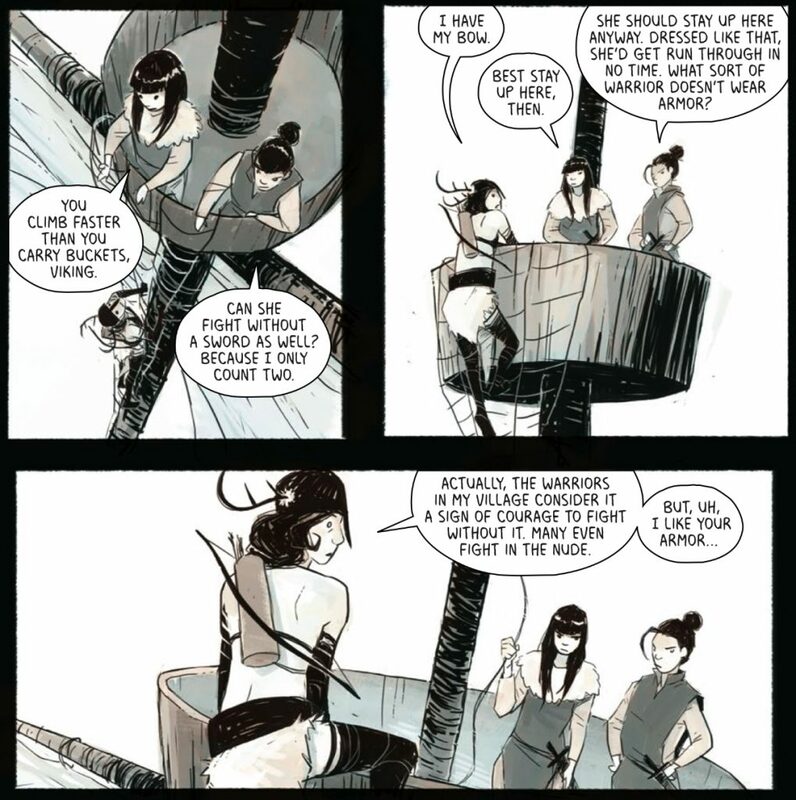 As I read Heathen #6 again, I realized beyond a shadow of a doubt that there was Aydis was definitely whitesplaining in some of these scenes. Whitesplaining is a form of discussion that essentially erases the experience of a person of color in order to make the white person feel better about themselves. It is akin to mansplaining, something that Aydis would never put up with if it happened to her. Rather than quietly listen to the feedback she receives from these WOC, many of whom have gone through unspeakable experiences, Aydis assumes that if she just extrapolated on her own experience for them, maybe they wouldn’t be so critical. Even in small conversations, this kind of dismissal of WOC is a textbook example of whitesplaining. It surprised me as a faithful reader of the series. One, because I had not expected it from Aydis, who up to this point in the story has been very invested in the stories of those around her. She cares about Freyja and Brynhild. But they are white women. It is unclear in the story and in the writing whether or not this behavior from Aydis is purposeful. Perhaps it is an exposure of the white feminism that Aydis must face within herself on her adventure, maybe something she will be confronted with and have to deal with later. Perhaps it is simply a warning to all white women about their own strong potential for whitesplaining. It did make me consider Aydis’s behavior, as well as my own potential for the same. Ultimately the women on board surprise Aydis with their choices, and she surprises them with an eventual genuine contribution. I will be interested to see how the relationships on board the ship work out for Aydis and for Makeda and her crew, and if Aydis will learn about her own penchant for the “Well, actually…” line.